Home / Modern Pest Blog / Is There A Safe Pesticide? Is There A Safe Pesticide? When a pest issue pops up, many people are faced with a dilemma: to have pesticides applied around my home, or to have my home invaded by pests? Although the concern of pesticides is understandable, there is a great deal more to pest management than just spraying pesticides. Simply stated, pest management is the management of pests, and pesticide use only makes up a fraction of this. Various non-chemical methods are also used in order to reduce pesticide use. 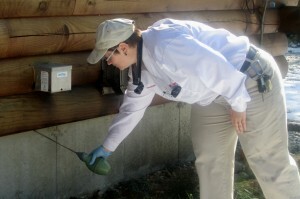 This is done for the pest management professional’s (PMP) safety and the safety of people, pets, and the environment. They thoroughly inspect a home or business for points where pests can enter the structure and seal them if possible. They look for areas in and around a home or business that are desirable breeding, feeding, and living environments for pests and recommend ways to make those areas less attractive or accessible to the pests. They place monitoring stations, such as glue boards, to check the extent of an issue and to see how effective proactive measures have been. They educate clients on pest behavior, sanitation practices, and exclusionary work that can reduce or eliminate pest issues. No chemical, be it the gasoline or diesel you put in your vehicle, or the ammonia in your window cleaner, can be considered 100% safe. Since pesticides are composed of one or more chemicals, there are none, including organic pesticides, that can be considered safe. What people should be concerned about is how hazardous a chemical is to them, their loved ones, their pets, and the environment. For instance, your shoe can be used as a pesticide when you use it to kill spiders and other pests. To you, a shoe seems rather safe, but it can be hazardous if it’s used in a way that can harm someone. This is also true of all chemicals. There are two factors that can make a chemical hazardous: toxicity, a chemical’s inherent poisonous effect, and exposure or how someone or something is exposed to that chemical. Dish soap seems safe enough, but it can still be harmful if used in ways other than what it’s intended for. You wouldn’t pour dish soap over your pancakes. At least I hope not. Bleach is a widely used cleaning agent used to kill potentially dangerous microbes. Therefore, bleach is a pesticide. It can also be extremely hazardous. There is nothing that can be done about its toxicity, but we reduce bleach’s hazards by diluting it with water, wearing gloves, allowing air circulation, wearing a face mask, and storing it in a durable bottle and in a safe location. They know which treatment methods to employ, which tools to use, and which areas to treat to rid a specific pest concern. They obey the federal law stating that they must adhere to the strict guidelines printed on each pesticide’s label. They are conscious of their surroundings, noting any toys, animals, and people that may be present, as well as any sensitive areas like open water. They target treatments toward the pests of concern. They only use an amount of pesticide necessary to treat the issue and are careful never to over apply. The pesticides used by PMPs are generally low in toxicity. With the addition of training, education, caution, and experience, the hazards associated with a pesticide are dramatically reduced by a PMP. For this reason, people who are untrained should not treat a pest issue themselves. A product purchased at a store can be as harmful, or more harmful, than the products a pest management company would use. How the pesticide is used will determine how hazardous it is, as well as how effective it is.